Thank you Les Vins Georges Duboeuf for sponsoring this post. 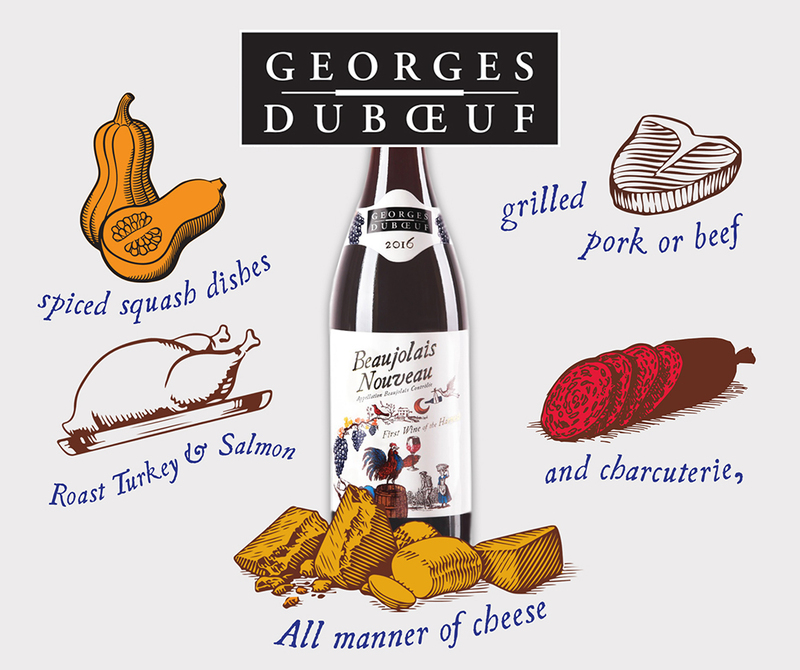 Learn more about Les Vins Georges Duboeuf’s fine selection of wines including the upcoming 2016 Beaujolais Nouveau by visiting Le Vins Georges Duboeuf! In today’s post, I am sharing with you a quick set up for an intimate friends-holiday dinner. I love getting together over the holidays with my friends. We are all so busy and it is very hard finding time to get everyone together. To make it easy, I decided to host those who can come to my house, and also meet up for coffee, tea, or dinner with others at different times. The holiday season is such a lovely time of year and I always put thought into what I will do, where I will go and who I will spend most of my time with. My home is very cozy and inviting and one thing I ALWAYS have for my friends when they come over, is wine. My wine of choice for the holidays, is Georges Duboeuf 2016 Beaujolais Nouveau and yes, it is a mouth full to say but even better a mouthful to taste. Beaujolais Nouveau can be thought of as the first taste of a new vintage, the first wine of the harvest and an indicator for the quality of that year’s vintage. I’m a wino and I cannot imagine a dinner or gathering without wine. It is that one item everyone shares and my group of millennial friends are quite keen on their wines. With that, I have to offer good quality and something special as I host this friends-holiday dinner. The wine is always released on the third Thursday of November, making it an annual tradition that also ushers in the start of the holiday season. The 2016 Beaujolais Nouveau displays a shimmering carmine color. Fresh aromas of red and black fruits, strawberry jam with hints of peach on the nose. It is fresh, fruity and flavorful on the palate. Delicious finish. Best served slightly chilled. If you enjoy wine as much as I do and if your friends do, too then go ahead and get some of this wine for your holiday gathering. It is not 6:00 AM and I want to run out and look for this wine. I will follow thru and salivate over their website. I was drawn to their labels on the bottle. Happy Holidays and you will be the first to know when I have my first bottle home with me on the sofa! LOVE your dress! Haven't heard of this before but def going to check it out because I'm a lover of Cab!! I wish I could be the wine expert as you are! Love the photos and the atmosphere! Nice place settings and I am happy to know we share that mutual love for wine lol! I will definitely try it out babe! Wow those look so good by the way you're describing them! I really want to try them now!! Are they from France? Great wine picks for the holidays. I love wine. Ever since I lived in Italy. Even the cheap stuff was the best. haha. This is such an amazing post !! Thank you so much for inspiring me to have a dinner party and I really love your outfit ! The dress is gorgeous and I also love your apron !! Love Beaujolais Nouveau!!! Oh, and I also love your fringe dress! So chic.